Message from Thoth: Who AM I? Workshop – Living Your Star Light (with Japanese translation). Tokyo 20 July. Osaka 24 July. What is Language of Language? ii) duplicating or transferring healing programs among crystals. She also revealed that many of the Atlantean healers were seeded in the Sirius star system. 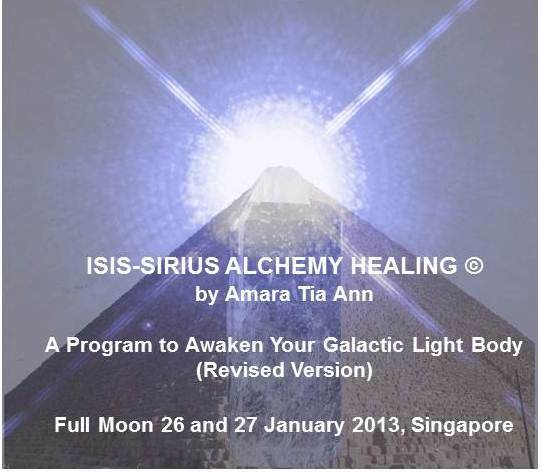 One of the objectives of the Isis-Sirius Alchemy Healing Course© (Revised Version) is to stimulate remembrance of our Atlantean healing gifts by receiving the initiations from Isis and the Sirian High Council. As a start, the crystal programming techniques highlighted above will be taught during the course. For course contents and registration details, go to Program. A few seats are still available for booking, please register early. As this course involves ‘live’ initiations and hands-on practices, Andy and I are reviewing the feasibility of making it available through “streaming”, videos or other broadcasting methods for subsequent classes, and will the make the necessary announcements once we are ready. Many Blessings, Amara Tia Ann. Ann believes in the axiom of As Above, So Below. Her passion is to explore the laws of the Universe (As Above), so she may apply them in the human world (So Below) to help manifest Heavenly experiences on the Earth plane. I welcome the opportunity to receive the healing course on live streaming video also. Thank you for sharing these gifts to the world. I too would welcome an opportunity to experience this course remotely from the US. Thank you for sharing your gifts. Thank you so much!! Yes i will be looking forward the posibility to join you on live streaming!! Much love and blessings from Mexico!! Thank you for considering additional means of sharing your gifts. I am very much interested, However, a trip to Singapore is not within my reach at present. WOW, I cannot wait the course is available on live streaming! !